Our Classic Hemmed Crewneck is the kind of perfectly simple, perfectly useful sweater that never makes it back into your drawer. It is pared down and flattering but roomy enough for layering. Knit in the round from the bottom up, the Classic Hemmed Crewneck achieves subtle shaping with the use of only a few easy knitting techniques. 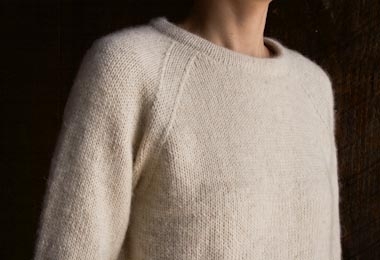 We knit ours with Purl Soho’s beautiful Flax Down. A single-ply blend of wool, alpaca, and linen, this yarn has a lovely bloom that seems to make the fabric glow! For more information, including materials, gauge, and sizes, please click Product Details, above. SAMPLES: The Heirloom White sweater pictured here is Size 37¾ with 5 inches of ease. The Toasted Charcoal sweater pictured here is size 42.